Ki is one of the most phenomenal artists of the 21st Century. This gifted and powerful author, singer, songwriter and poet of truth has given us a CD that defies categorization. Some would call it Gospel and others musical dramatization… others just hear music. But most call it brilliant. “My Soul Confessions” is a message-driven and heart revealing project so powerful, so electrifying a style and deliver, it defies the generation gap, engaging both young and old in a language each can understand. His music is a reflection of Rock, Jazz, R&B, and contemporary Christian; a poetic masterpiece with a sweet, hometown attitude; an art once called Soul, the fundamental foundation that made old school old. His lyrics are insightful and filled with veracity. His sometimes soothing and seductive, sometimes rippled and forceful voice is now the rallying cry for change in today’s world. Although, Ki played piano as a child, it wasn’t until he became a teenager that his talents were developed. His family’s church did not have a musician and Ki played what cords he could to help during testimony service. At 17 years old, Ki began composing music. To date he has written over 400 songs, commercial jingles, and produced numerous projects in numerous genres. In 1993, he was selected out of 800 national entries and presented the Sony Innovators Award for his vocal and composition skills by the Sony Corporation, since then, he has produced the “Debra Duncan” talk show for ABC Channel 13 KTRK in Houston, TX as well as Executive Producer for other Television Shows. Ki currently owns and operates Omega Records, which is the home of 3 Contemporary Gospel/Christian Artists and several Secular Artists; Omega Management, and Omega Sound Lab Recording Studios in Houston Galleria Area. 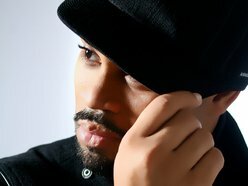 With his heart pounding Powerful Rock influenced single “Whatcha Know About Jesus” and classic inspirational hit “Jesus, Take the Lead”, Ki captures his listener with his smooth voice and passionate orchestrations. Not only is he a vocalist, pianist, composer, producer and arranger but a father as well. He writes, arranges, and produces his own music. His talent is forthcoming and can be compared to Luther Vandross, Donny Hathaway, and Stevie Wonder. His musical influences are mainly jazz and classical. He is a self-contained Artist with a classic stage presence.